I really love participating in blog hops and one of my pet peeves is when someone is late posting their post. And then I do so. Twice even. The first time I had technical difficulties with my computer but this time is all on me. I had written down the wrong date for the hop and I am really sorry about that. So I might be a day late but I wanted to show off my creation. Lisa, the wonderful hostess for this hop, had sent me a focal and a couple spacers from Ema K. I had a dickens of the time with this focal. It just screamed of times gone by and I was thinking a bracelet for the longest time. In fact, I still have everything laid out for a bracelet but the idea just didn't pan out. Okay...so now I am suffering a total block. Never had that happen before. I mean, yeah, I have been lazy and not made it down to my studio before. Yet once I make it down there though and put away the goodies I had acquired, my muse would be awake and ready to go. Not lately though. Oh I have been making things. I just am not satisfied. Yet. 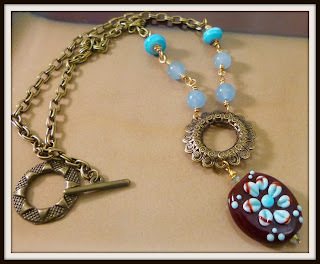 I have remade this necklace a couple times and I still don't feel that I have done justice to this beautiful lampwork. I don't have any more time though so I will show it in its present incarnation and I will be sure to show it off once I am satisfied. Now that you have seen mine, be sure to see what everyone else has come up with. I know that is where I am heading now. And be sure to check out Ema K's shop. I just love her copper focals! I really like this necklace. The contrast of the eyepopping lampwork with the muted metal is nice. What a lovely focal. I think it turned out very pretty. A real pop of color at the end. Shaiha - I think this turned out great! I love the brass paired with the brown and blue tones. Thanks for being in the hop! Beautiful piece...thanks for the post and sorry life got in the way...isn't that always the way? I was a day late as well in posting. I actually enjoy the piece. It will look great with an ivory blouse!